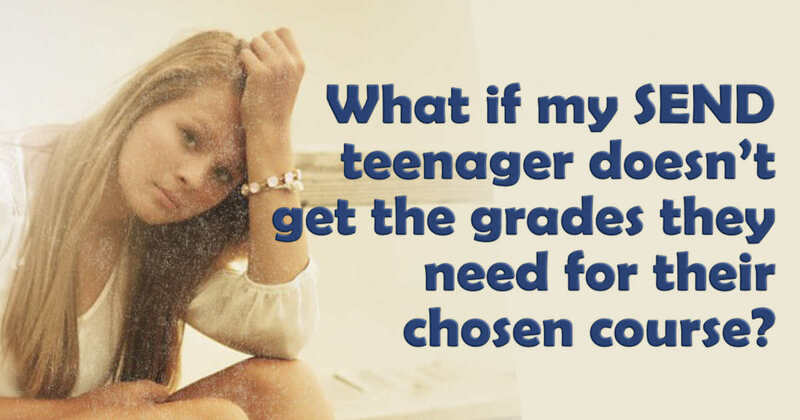 Home SEND Exams What if my SEND teenager doesn’t get the grades they need for their chosen course? I wrote recently about how Son1 made a silver lining out of the clouds created by the grades in his disappointing AS results a year ago. The Department has received a number of queries about entry criteria for young people with Education Health and Care plans (EHC plans) who are sitting GCSEs in year 11 or resitting GCSE English and Maths in Year 12; and hoping to study at Level 3 in school 6th forms, mainstream FE/sixth form colleges or SPIs. The situation for these students is the same as for any student going on to follow a course which is dependent on achieving certain grades. When assessing which study programme the student should follow, local authorities should consider whether the student has the aptitude to follow the course and whether it would meet their needs. This may not be dependent on the student passing a certain number of GCSEs or GCSE maths and English. If it seems likely that the student may fail by a large margin and would struggle with a Level 3 course, then the local authority should consider other options. For students waiting for the results of their exams, it is always good to consider what alternative options are available and have a conversation with them early on, so that, should results have an impact on the course they can access, an EHC plan can be changed with agreement from the student. Schools and colleges have the option of being more flexible about entry requirements for students with EHC plans, if it seems likely that the student could cope with the course. There is nothing in statute which says students must achieve certain results to follow a Level 3 course, and students with EHC plans have generally faced significant challenges in their education. The key focus has to be about which study programme will help them reach their outcomes. For students who narrowly miss a Grade C, providers may wish to allow them to follow Level 3 programmes while continuing to study GCSE maths and English. It's improbable that this information will have otherwise reached you, so I thought it a jolly good idea to let you know, in case this unfortunate happening is around the corner - and I most certainly hope it isn't. Don't forget, a child with additional needs can have a statutory Education, Health and Care Plan up until the age of 25, should they need it. It's also valid for those with SEND who are on Apprenticeships or Supported Internships. Just after the results, we'll have a post from Bren about Access Arrangements for the coming year - best to start early - so if this is a concern for you, your son or daughter, please look out for it. Has this happened to you, or have you helped a teenager in this position, even if they don't have special educational needs? If so, please leave your comments on this blog post comments, below. My son's transfer to an Apprenticeship is a mess, please help!